Crispy Brussels sprouts with pancetta is easy and delicious side dish. 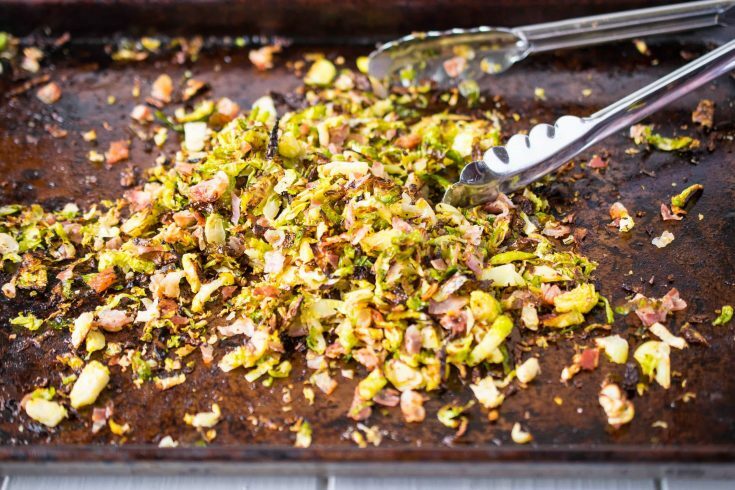 Shredded Brussels get a little Italian flair by roasting them with pancetta until perfectly crisp. Thanksgiving is almost here and if you’re looking for something easy to do with your Brussels other than just boiling, this is the recipe for you. For me, roasting Brussels sprouts is the only way to prepare them. If you’ve ever roasted brussels, you’ll know that there are always the few leaves that fall off and get crispy and good. In my kitchen, these never make it to the table (if you know what I mean?). This is what inspired this recipe. When I was asked by my friends at Foodiechats to come up with a recipe using the new Veggie Bullet, I jumped at the chance. It is a shredder, spiralizer and slicer that will make it look like the fine knife workings of a chef. Veggie Bullet is a 3-in-1 food prep with settings for spiralizing, shredding and slicing. This one-of-a-kind machine preps huge quantities of vegetables, fruits, cooked meats, and more in mere seconds—allowing you to prepare and serve a wide variety of healthy foods in fun, exciting ways. Make zucchini noodles for tonight’s dinner, then shred a whole head of cabbage for coleslaw, sautés, pickles, and soup later on in the week. Not sure what to do with those veggies hanging around in the fridge? Make a chopped salad, make carb friendly cauliflower rice. 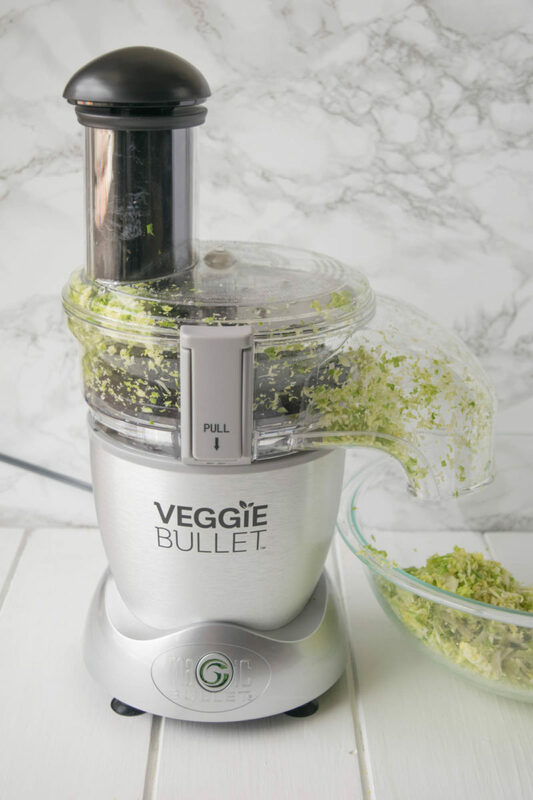 The Veggie Bullet shredded 2 pounds of Brussels Sprouts in a matter of minutes. Normally when I roast vegetables and Brussels, I coat them in a light olive or vegetable oil. When testing this recipe, using the oil weighed down the delicate leaves and they didn’t get very crispy so I used a light coating of oil spray. With the upcoming Christmas holiday, don’t forget to add the Veggie Bullet to your Christmas list. It makes a great gift for the cook in your life. Veggie Bullet is available at www.NutriLiving.com, Walmart, Bed Bath & Beyond, Kohl’s and Target for only $149.99! 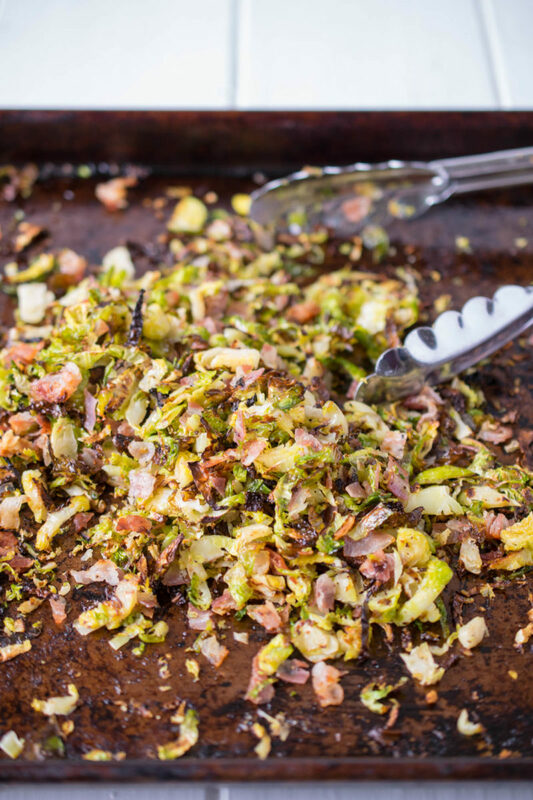 Shredded Brussels get a little Italian flair by roasting them with pancetta until perfectly crisp. Add the Brussels sprouts and pancetta to a large baking sheet and mix well. Spray evenly with oil and sprinkle salt and pepper, mix well and spread into an even layer. Roast for 18 minutes until brown and crispy. Serve warm. I’m with you, roasting brussels sprouts is the only way to go! And that’s a pretty niffty little gadget too! I think brussels sprouts are a must on any holiday table and adding some pancetta makes it all the better 🙂 Hope you have a very happy Thanksgiving my dear. Thank you so much Kathleen. Happy Thanksgiving to you. You’ve made Brussels sprouts look SO delicious! Haha, I know EXACTLY what you mean! Roasted brussels sprouts are the best, and I always pick off those crispy outer leaves first. Shredding them first is a great idea (and so easy with the right machine). I’ll have to give this a try! Hubby loves Brussels Sprouts cooked with bacon. Great idea using pancetta! Never tried shredding the spouts before baking them. Must try this as they look so crispy. I need to be eating more brussels sprouts now that they are in season. This is such a great idea!